Registration is from 10 am to noon the day of the fair. Judging begins at noon; prizes awarded at 3 pm. Entry fee is $10 per vehicle. Tractors and motorcycles are welcome on display only. *Entries for judging must be in place by noon. First 100 vehicles will receive a Turkey Fair dash plaque. 1st and 2nd trophies will be awarded in each category. Thanks for your comment. We’re sorry to hear that you feel the draw may not be fair. While the Turkey Fair doesn’t actually run the car show, we do know that each registrant is given a ticket off of a roll when they enter – each ticket having an 8 digit number on it. In light of that we’re not sure if it would be possible to choose a certain ticket for each prize. We certainly hope that the car show has a good reputation and we know it has enjoyed great attendance over the years. I was a first time participant at last year’s car show and had no feel that the door prizes where fixed. That is just how things work whether the draw is by numbered tickets or drew from a hat. I help run things at a Cornwall, Ontario car show and cruise night and the “luck of the draw” always seems to go to the same people because those people are always present for all the events. I am looking forward to this year’s event and I hope to bring some of our club members with me this year. Thanks for your feedback! We’d love to see you and some of your fellow members at the car show this year. 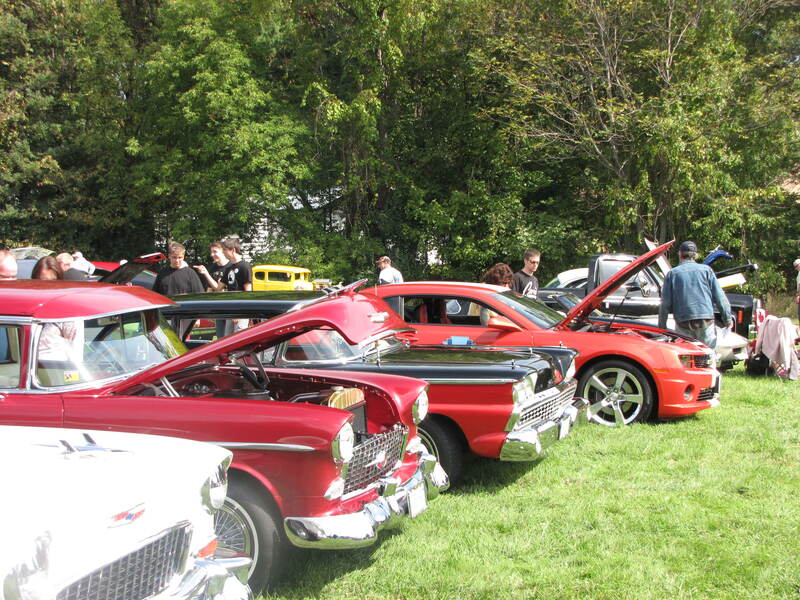 Can you register for the car show if you do not have Ontario plates and registration yet? We are new residents and have not had the chance to swap all of our vehs. over yet. We’re happy to have you with or without Ontario plates! First time at the show this year and both myself and my wife really enjoyed it. Lots to do for the girls and lots to see for the guys at the show. One thing that maybe could be added would be announcing the winning car year and model along with the owners name. Nice to hear what actually took the prize rather than who. Other than that we thought the show had a great turn out, door prizes were great and just a fun day. Well be back next year. Last year people were voting for the vehicles before the noon deadline not giving a lot of cars that were still coming in a chance. Thanks for your comment. I’ll pass this info along at the next committee meeting. Thanks for the tip! So glad you enjoyed last year. Awesome, and the weather should be nice… wondering why you stopped prizes for Production at 1990…. dang, mine is a 91……Mustang Cobra GT, where does it fit in? As the cut off for Stock Production is 1990, perhaps you could enter in the Special Interest category. Hope this helps and we will re-evaluate categories for another year. Thanks for your interest and hope to see you at the Turkey Fair on Saturday. Our first visit was in 2014. had a great time, lots a really nice vehicles. Very good breakfast & lots to see. Will for sure be back in 2015. Tom & Lynda Lou. Thanks for the kind feedback! Have a great time at the next fair. I’ll be there for the first time.How many cars do you usually get and is it participant or formal judging? Hi there – we get about 120 cars and it’s participant judging. We look forward to having new participants! Hi there – the weather is a factor obviously, but last year we had 80 and have had 100 in the past. It’s a well-attended show. The Kingston Show is always the Saturday of Labour Day Weekend. There were over 360 vehicles this year. Brockville had it’s Big Show , August 6th, 2017. It also had a very large turn out. Wow, it’s a great summer for car shows! 2018 & we will attend the Lyndhurst Turkey Fair & Car show. #1 on our list of must attend. See you all on Saturday Sept. 15. Lynda & Tom.